Unless you’ve sampled Greenfield’s Real Pickles, chances are the pickles you’re familiar with have been made with vegetables that have first been cooked and then marinated in vinegar. While this process has been around for a long while—there’s evidence that Cleopatra enjoyed vinegar pickles—until the modern industrial era of processed and packaged foods another, much more ancient and popular technique ruled supreme. Not only did this method preserve the vegetables, but it offered unique health benefits and flavors that pickling with vinegar does not offer. Real Pickles founder Dan Rosenberg has been pickling for over a decade, and he’s never once used vinegar. Instead he uses water and sea salt, and depends on lactic acid fermentation—also known as natural fermentation—to pickle the locally grown, organic vegetables used in all his products (which include cucumbers, cabbage, carrots, garlic and beets). When the vegetables are submerged in the brine and packed in air-tight containers, the salt helps preserve them, but also draws out the sugary juices. When the naturally occurring microscopic cultures found on the vegetable’s surface (similar to those used to make yogurt) mix with the sugar, fermentation occurs, and a number of healthy substances are produced, including lactic acid. This acid preserves the vegetables and creates the sour pickle taste. Unlike pickling with vinegar, the cultures and enzymes created through lactic acid fermentation improve your digestion, help you absorb nutrients better, aid in metabolic functions, and work to prevent harmful microbe growth in your intestines. Lactic acid itself is known to help normalize acid levels in your stomach, assimilate proteins, and promote cell metabolism. Studies have shown that naturally fermented vegetables can be healthier for you than not-pickled, fresh ones. “When you’re making vinegar pickles you get a more uniform product, and it’s generally a lot faster,” Rosenberg explained in an interview with the Advocate last week. If refrigerated to slow the fermentation process, Rosenberg’s pickles will remain good for two years or more, but since the flavor from vinegar pickles comes from the vinegar and not an ongoing chemical process, they can sit on a shelf a lot longer without going bad. “Sometimes people ask us whether we’d sell the business to some big corporation,” he said, laughing, “but I don’t know any big corporation that would be interested in us. What we do is really a craft. It’s artisanal. It’s something that would be really difficult to do in a mass production setting. Rosenberg knows of a company in Quebec that has been working with a lab to standardize the fermentation process, which they have done by developing their own strain of vegetable and inoculating it, but he doesn’t find the notion of uniform pickles very compelling. It’s the variety of each year’s harvest and how each batch ferments that interests him. Rosenberg graduated from Brown University in the late ’90s with a degree in geology, but an interest in locally grown produce led him to spend his time working on organic farms in the Northeast, including UpinnGil Farm in Gill. After attending a Northeast Organic Farming Association workshop, he began pickling for himself as a way to keep eating locally grown produce throughout the year, and as he started to investigate traditional pickling methods, he discovered the book Nutrition and Physical Degeneration by Dr. Weston A. Price. After two years of pickling for himself, Rosenberg began Real Pickles and started selling his products in 2001. While he doesn’t anticipate being bought out by a large corporation, this isn’t to suggest that Real Pickles isn’t doing well. After seven years of sharing the kitchen and facilities at the Franklin County Community Development Corporation (CDC), last year Rosenberg and his 10 employees moved operations across the street to a former warehouse. 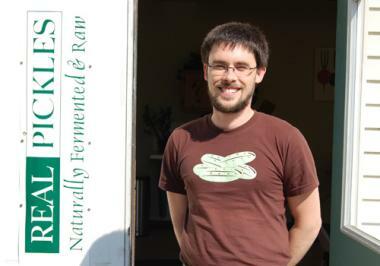 He bought the hundred-year-old 12,000-square-foot building with financial help from the CDC and the Equity Trust, and with USDA grants and utility company rebates, Real Pickles turned the space that had been divided up into small offices with drop ceilings into an energy-efficient, state-of-the-art pickle producing facility that includes a large kitchen and walk-in cooler. The cooler is stacked with boxes of product, but the kitchen is surprisingly stark. Because there’s no cooking involved in the Real Pickles process, the space is mostly filled with sinks for washing the vegetables and counter space for chopping and bottling the pickles. Rosenberg delights in having brought new purpose to the old post and beam building and is proud that his production process has a relatively low energy footprint. Beyond the economic and health benefits of locally grown, naturally fermented pickles, the central joy Rosenberg finds in what he does has to do with the culinary aspects. “I also enjoy working with the local farms,” he said. “It’s definitely one of my favorite parts of the job. In limited cases we’re buying produce from some of the bigger farms that they would have grown anyway, but mostly the farms are specifically growing crops—or certain quantities of crops—to satisfy our needs. Each winter we’re talking to all the farms we work with, making verbal agreements about what we’re looking for and what they’ll agree to grow. The nine products Real Pickles currently sells all originated from the home in Montague that Rosenberg shares with his partner, Addie Rose Holland. He experiments with ingredients grown in his garden in small batches, and depending on how the different recipes turn out, he tries them in successively larger batches. Not every vegetable turns out as he’d hoped. “I’ve tried a lot of vegetables over the years,” he said. “In my experience, zucchini’s been kind of rough. I’ve had other people’s that tasted okay, but when I tried it at home, Addie said, ‘Take that straight to the compost pile.’ And last year I had an even worse experience with asparagus. “There was another pickle I was really excited about a few years ago,” he said. “We were really close to producing it as a commercial product. There’s this Mexican red onion, and sliced really thinly with a little bit of oregano, it tasted just incredible on burritos, wraps and burgers. But when you opened the jar, and you got a whiff of it….” He cringed and smiled. As it is, printed on each jar of Real Pickles is more text preparing customers for what they’re about to enjoy than the actual list of ingredients. On the dill pickles, for instance, the label reads, “Batches vary in taste and texture. Contents may bubble when opening. Cloudy brine is a natural by-product of the fermentation.” It’s not the kind of marketing-speak you’re likely to find on a mass-produced pickle, and Rosenberg finds their best customers are those who eat local produce and are used to products with natural variation. But it’s an education that pays off quickly—as soon as the jar lid is unscrewed and the aroma wafts out, it’s instantly apparent that what’s inside is bursting with activity and flavor. Unlike vinegar pickles, naturally fermented pickles breathe every time you open the jar, and instead of simply smelling the vinegar, it’s the complex blend of the other ingredients that comes to the fore and occupies your palate. As well as enjoying the unique flavors of each sample provided by Real Pickles, the tasters working the Valley Advocate’s completely unscientific test kitchens this past weekend noticed almost immediate changes in their own physiology. Mild cases of heartburn, acid reflux and constipation experienced prior to trying the pickles all appeared to be somewhat mollified the next day after an evening consuming healthy samples of the food. In addition, a good deal of beer (locally brewed, of course) was consumed at the testing table, and upon waking there were no complaints of adverse reactions to the high levels of alcohol consumed with the pickles the previous evening. As tasty as some vinegar pickles can be, there appears to be a whole lot more going on in a container of Real Pickles. There’s art in the jar. Reviews of Real Pickle’s current product line can be found here.